Such beauty and opulence. The czars had it all. I only wish that the tour included more about the how the ordinary people -- the servants -- lived. Overkill with Cathrines palace. Hydrofoil ride back was "just" a waterbus. Gardens and fountains are NOT as impressive as Versaille. Optional tour worth every penny. Optional tour worth every penny. The grounds outside are as spectacular as the art on the inside. Outstanding experience visiting the grounds and fountains of this palace. Outstanding experience visiting the grounds and fountains of this palace. Very crowded but extremely well worth a visit. 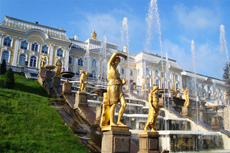 Peterhof palace - 500,000 people there! Excellent, excellent one-of-a kind experience. Excellent, excellent one-of-a kind experience. A little longer bus ride (45 minutes) because it is well outside of the City but you have a lot of free time to wander the gardens after the tour. I felt rushed through the palace part. I felt rushed through the palace part. The grounds were lovely. Very, very nice! We had good weather, so all the gold and water glittered! It was nice to walk through the vast gardens. Very comfortable trip tour guide very informative. Very beautiful and full of history. Very beautiful and full of history. The gardens were exceptional. What people can create when they try to! What people can create when they try to! Unbelivable fountains! Great tour. The grounds are gorgeous. We returned to St. Petersburg by Hydrofoil. Fantastic guide, Anna, led us to this beautiful palace and grounds. Fantastic guide, Anna, led us to this beautiful palace and grounds. We enjoyed walking around it. Far cheaper to go with TJ Travel than the ships tour. the interior tour of Peterhof is quite regimented. the interior tour of Peterhof is quite regimented. the docents keep the crowds moving, leaving little time to appreciate the rooms. the display when the fountains are turned on is very interesting, but also extremely crowded! Tour guide was fantastic. Fountains were amazing. It’s a sensory overload, though. Very beautiful. Once again...so much to see ...watched Changing of the Guards ...such a beautiful place. The grounds and palace are phenomenal. Amazing gardens, water feature and golden statues.